The so-called "Pivot to Asia" initiated under the administration of US President Barack Obama as a means of reinvigorating US influence across Asia Pacific vis-à-vis China has resulted in a backlash against tired US policies predicated on "democracy promotion," "rights advocacy" and increasingly meaningless economic and military ties between Washington and the nations of Southeast Asia. From a "pivot" that was presented as a means to win over allies across Asia through economic trade and regional security underwritten by US military might, under the administration of current US President Donald Trump, US foreign policy has shifted decidedly toward a coercive and punitive posture to reestablish Washington's influence. It can be argued, however, that the "pivot" was from the beginning, merely window dressing for a policy that was little more than a highly focused effort to coerce and punish nations for moving out of Washington's sphere of influence, and into Beijing's. In Cambodia, this backlash against US intentions has been particularly acute. The Cambodian government under Prime Minister Hun Sen has shuttered and expelled US State Department-funded fronts posing as nongovernmental organisations (NGOs) including media organisations, as well as arrested opposition leaders and disbanded the opposition's political party. In turn, the US has imposed visa restrictions on individuals within the Cambodian government involved in the crackdown on US-backed political activity in the country. The United States said on Wednesday it would restrict entry to people involved in the Cambodian government’s actions to undermine democracy, including the dissolution of the main opposition party and imprisonment of its leader. The Cambodian opposition party in question is the Cambodia National Rescue Party (CNRP). 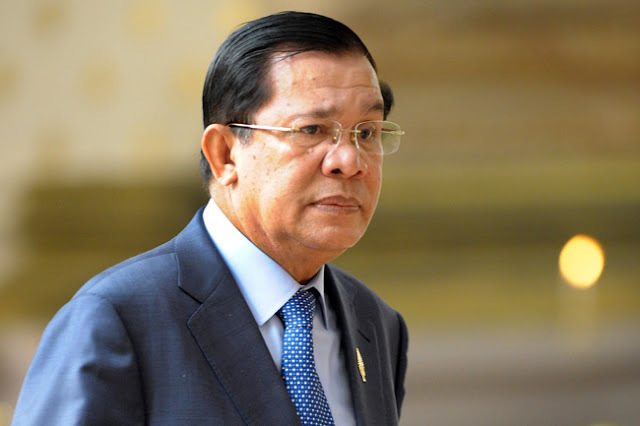 Its leader, Kem Sokha who was arrested on charges of treason, is not merely a victim of politically-motivated hyperbole, but faces serious charges based on Sokha's long history of openly courting US support in what he himself characterised as a Serbian-style plot to overthrow the current Cambodian government. And, the USA that has assisted me, they asked me to take the model from Yugoslavia, Serbia, where they can changed the dictator Slobodan Milosevic. You know Milosevic had a huge numbers of tanks. But they changed things by using this strategy, and they take this experience for me to implement in Cambodia. But no one knew about this. It is openly acknowledged by newspapers like the New York Times in articles like, "Who Really Brought Down Milosevic," that the US was the principle sponsor and director of protests and subversion that ousted Milosovic from power. Likewise, evidence reveals the US playing a similar role behind Cambodia's so-called opposition. 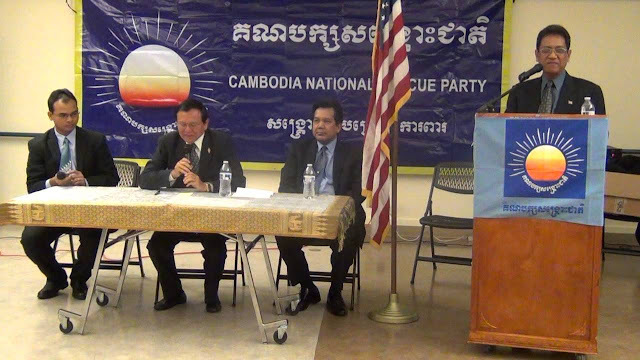 Image: The "Cambodian opposition" is backed and directed by Washington D.C. The US flag sitting in the middle of what is supposed to be a Cambodian opposition event is a reminder of the cartoonish nature of what is presented as "democracy" by the US. Sokha has also been caught on video in Washington D.C. with US Senator Ed Royce with the two jointly calling for the overthrow of the Cambodian government and for Sokha's party to be put in power in its place. Spinning Political Interference as "Democracy Promotion"
Much can be gleaned from reading even the most poorly informed analysis regarding US foreign policy in Asia Pacific. Such analysis includes that written by long time Council on Foreign Relations Senior Fellow for Southeast Asia Joshua Kurlantzick, particularly his most recent piece titled, "The Trump Administration Takes Action Against the Hun Sen Government." It is uncertain whether or not Kurlantzick actually believes what he writes, or is simply charged with producing narratives which are then faithfully transcribed by Anglo-American and European media. Either way, his insistence that Cambodia's efforts to uproot US interference in its internal political affairs amounts to "a totally undemocratic farce" helps provide cover not only for open and continuous US-backed subversion in Cambodia and across the rest of Asia, but also helps justify increased pressure from Washington on Phnom Penh for attempting to counter such interference. Nowhere in Kurlantzick's piece on US "democracy promotion" in Cambodia is it mentioned that the "independent radio and print outlets" the government shut down were in fact funded and directed by the US government and are in no conceivable way "independent." Nowhere in Kurlantzick's piece is it mentioned that Kem Sokha himself has openly and repeatedly admitted to being a foreign agent working toward regime change in Cambodia with US sponsorship. When invoking the term "democracy," the first and most elementary notions that should come to mind include self-determination. The Cambodian people are in no way determining anything for themselves if everything they hear, read and listen to is a result of a foreign government's interference in that nation's political affairs. Nor are Cambodians able to determine anything for themselves through representatives contesting elections who, in fact, represent Washington, not the Cambodian people. ...the steps taken this week are important signals to Hun Sen, and might help slow him down as he guts the country’s institutions and prepares for an unfree national election next year. In addition, other major actors in Cambodia, such as China, probably do not really want the country to spiral into economic chaos, or for Hun Sen to force Western donors to cut off aid. So, there are still points of leverage in the Cambodian crisis. No doubt, Washington sending an "important signal to Hun Sen" is also meant to deter other nations in the region from likewise uprooting and expelling what is essentially US interference in what should be the internal political affairs of sovereign nations. Kurlantzick's "analysis" will be repeated as talking points throughout Anglo-American and European media which will likewise fail to point out Washington's role behind the organisations and political parties targeted by Cambodia's government, or how US interference in Cambodia's elections is precisely the opposite of "democracy" or highlight the hypocrisy of the US accusing Russia of interfering in its elections while the US openly interferes in elections worldwide. For Cambodia, successfully uprooting US interference in its internal affairs sets a precedent others in Southeast Asia will in one way or another attempt to replicate. Cambodia's Thai neighbours are currently attempting to uproot a political opposition party headed by ousted former prime minister Thaksin Shinawatra. Malaysia still grapples with Anwar Ibrahim's US-funded political networks and Myanmar currently suffers under a government installed by a decades-long efforts by the US and its allies to co-opt and control the nation's resources, people and destiny. Cambodia's success in expelling the US interference, or the United States' success in imposing its will on the Cambodian people under the guise of "democracy promotion" will set the tone of America's ongoing, awkward and increasingly confrontational "Asia pivot."